Fourteen-year-old Sophronia is the bane of her mother’s existence. Sophronia is more interested in dismantling clocks and climbing trees than proper etiquette at tea–and god forbid anyone see her atrocious curtsy. Mrs. Temminnick is desperate for her daughter to become a proper lady. She enrolls Sophronia in Mademoiselle Geraldine’s Finishing Academy for Young Ladies of Quality. But little do Sophronia or her mother know that this is a school where ingenious young girls learn to finish, all right–but it’s a different kind of finishing. Mademoiselle Geraldine’s certainly trains young ladies in the finer arts of dance, dress, and etiquette, but also in the other kinds of finishing: the fine arts of death, diversion, deceit, espionage, and the modern weaponries. Sophronia and her friends are going to have a rousing first year at school. Super-fun! Ridiculously exciting! Don’t read this; listen to it! Basically, this is how I felt the entire time I listened to the audio version of Etiquette & Espionage. Even the opening chapter hooked me, with Sophronia taking tumbles down the dumb-waiter shaft, in an effort to eavesdrop on her mother and her mother’s visitor. Sophronia, for all her faults and teenagery-ishness, was a fun, likeable character who did not look at herself and think “woe is me,” but decided that is her mother was shipping her off to Mlle. Geraldine’s Finishing School, well, she was going to make the best of it. And as it turns out, Finishing School isn’t so bad after all! Sophronia begins learning how to be a proper lady, how to bat her eyelashes effectively, how to throw knives, and that a lady should never be without her hair ribbon, a pair of scissors and some perfume. Hey Mom, can I go to Finishing School?! It was not without its faults. There were a few things that bothered me, namely the shameless token black boy. That he was a token black boy wouldn’t be enough to bare mentioning, except that he was also a) a “sooty” (someone covered in soot from working near coal), b) nicknamed “Soap” because he was sooty all the time, and the worst offender: c) his name was Finneus P. Crow. Yep, CROW. As in a black bird. My eyes rolled so far back in my head, I could see my brain. 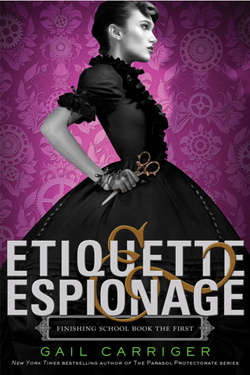 BUT – Etiquette & Espionage was just a blast! In a steampunk world with fun gadgets that I had no problem picturing, because the author brought them to life with her words, I lived and breathed how to be a proper lady and how to be sneaky, too. The plot was subtle: a prototype has been squirreled away by one of the girls who is trying to Finish and Sophronia and her friends have decided they would like to be the ones to find it. Add in a dash of werewolves, a sprinkle of vampires and you’ve got a recipe for success. Moira Quirk is absolutely wonderful to listen to! This is easily a book I probably wouldn’t give a second glance to if I had to read it, but her narration was simply riveting! She can do a Scottish brogue and a boyish whine and the deep sounds of a flywayman demanding a prototype. I’ve never heard narration as superb as hers and I could listen to her read a grocery list! For instance, when describing the foggy moors over England, her voice took on a tone that suggested gray, drear and a murk you would find on the moors. Basically, she brought Carriger’s words to life in my mind. She is easily the best narrator I’ve ever listened to.